I first met owner Brandon Clark and his best friend and right hand man Neil Ornella at the ORHMA awards at the Nottawasaga Inn. They were alongside Marco Ormonde from The North offering diners classic Whiskey Sours, traditionally made with Crown Royal, fresh lime juice, simple syrup, egg whites and bitters. The attention to detail for a drink is unusual for a bar, but quality matters and they know it. The drinks were fabulous and I decided then and there, drinks and dinner at Kenzington was in order. I rolled in first one Saturday night with a gal pal; we took our seats at the bar, this being one good looking, fully stocked, back lit, bar that serves up classic fresh made cocktails. We ordered our drinks and settled in with spinach dip for snacking, having observed the size of the loaded nachos and realizing it was far beyond the size of our appetites. I don’t usually recommend drinks, but I can’t say enough about the cocktails shaken and stirred at Kenzington. 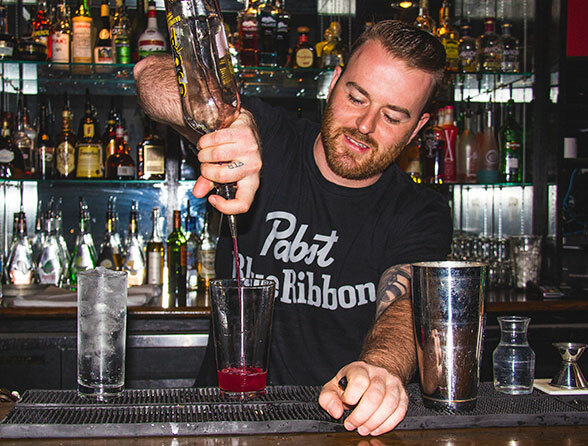 The talented bartenders are mixing up classic signature cocktails, using fresh ingredients. Fresh makes the difference be it at the bar or in the kitchen, as Neil Ornella tells me “we use fresh squeezed lime juice vs bar lime, we do it properly”. The bar also houses the mighty iMac, with a playlist I would like to have. The music is the perfect accompaniment, it keeps the room humming until the live band starts. Neil Ornella told me during our interview that he is responsible for the bar music, which is a compilation gleaned from their own playlists, carefully blended to suit the mood of the days. If it’s Saturday afternoon; it is going to be Blues and Rock, Stones and Faces, Led Zeppelin with a side order of Motown. Very tasty! Neil apparently takes to the stage to play music too and I am marking my calendar for the annual “Those Guys Christmas Spectacular”. I returned to the Kenzington with an appetite to try the namesake burgers; taking two hungry teens with me. A first for me was the bartender’s creation of a namesake cocktail; the “Penelope” was to my liking, Grey Goose based, magic in a glass with a hint of lime, it had my taste buds primed for the main event. The menu is ably explained; step one, pick your style of burger, step two, pick your bun, gluten free options are available, step three, pick your meat, beef, chicken, turkey or veggie, step four, choose your side, perhaps you’re in a mood for fries or rings, or green it up with a salad. There are suggested favourites too; I went with the “Black & Blue”, Blue cheese, blackened spice and bacon”, on a Brioche Bun. The “Californian” is a popular choice; avocado, Monterey Jack, bacon and chipotle mayo. Feeling “Crazy”? That menu item requires 24 hours’ notice and includes 1 lb. of beef! 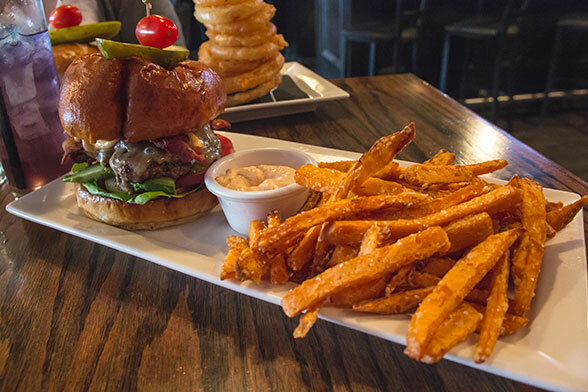 For non-burger fans there are numerous poultry options, veggie wraps and the Canadian tradition of Poutine also appears in a plethora of incarnations. We three were pleased with our burgers and sides. 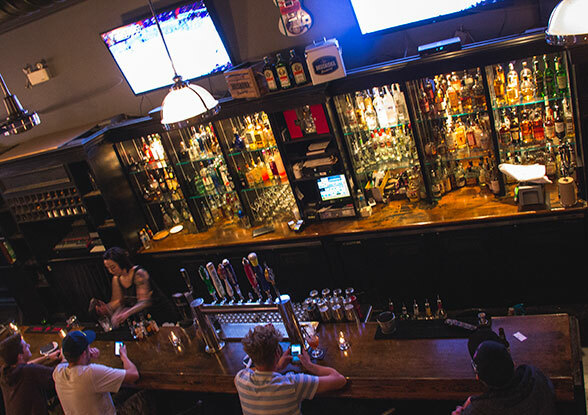 The kitchen is small, so sip your beverages slowly, staff are upfront about this and your burger is worth the wait. As they say, this is “simple food, done properly”. Timing and longevity are partners for Brandon Clark; Kenzington has been a fixture on Dunlop Street for seven years now and we can expect to see cross branding with his purchase of Tropical North next store. This partnership is hot, bringing watersports and SUP rentals to the waterfront and these sports enthusiasts will logically bring their appetites to Kenzington Burger Bar. 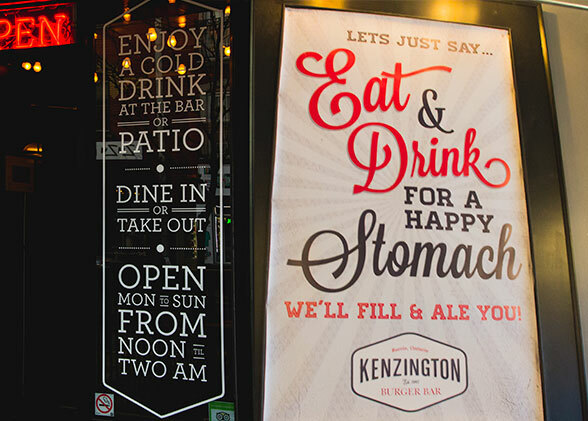 Another appetite enticing option is for the Kenzington Food truck to come to you! What a great way to bring flavour and party atmosphere to your wedding or family celebration. I wonder if it comes with the same great sound track. 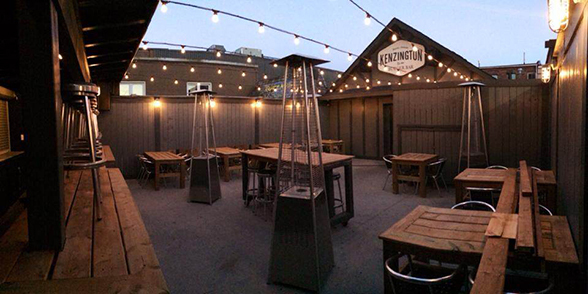 Well Neil and Brandon, I think business at Kenzington Burger Bar is about to become even more incredible! 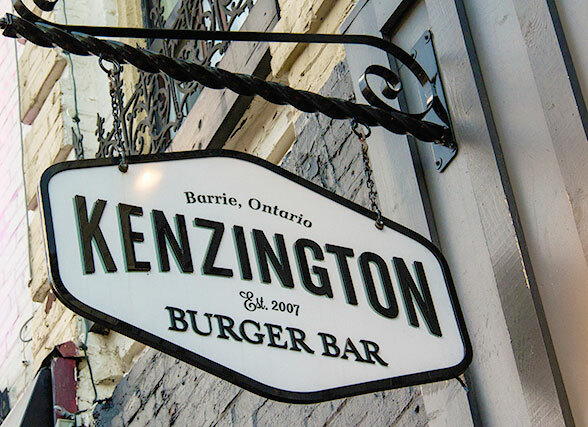 The famous Kenzington “Kitchen Sink burger” caught the attention of John Catucci, host of the Food Network’s “You Gotta Eat Here”, who came recently with the film crew to the resto and shot a segment for the series which will air during Season 4 in the new year. Big congrats! I hear mojitos are making an appearance on the summer menu, fresh muddled mint and lime, a fitting time to raise my glass to toast your continued success!